A lovely digital reconstruction covering several sites produced by the Danish National Museum. 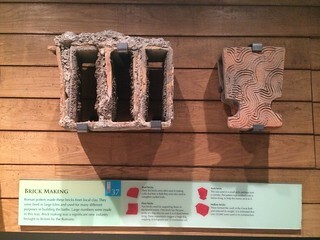 It includes demonstrations of how buildings were made and fly throughs of reconstructed buildings too. There’s plenty to see. so get a cup of tea or horn of mead and enjoy the show! 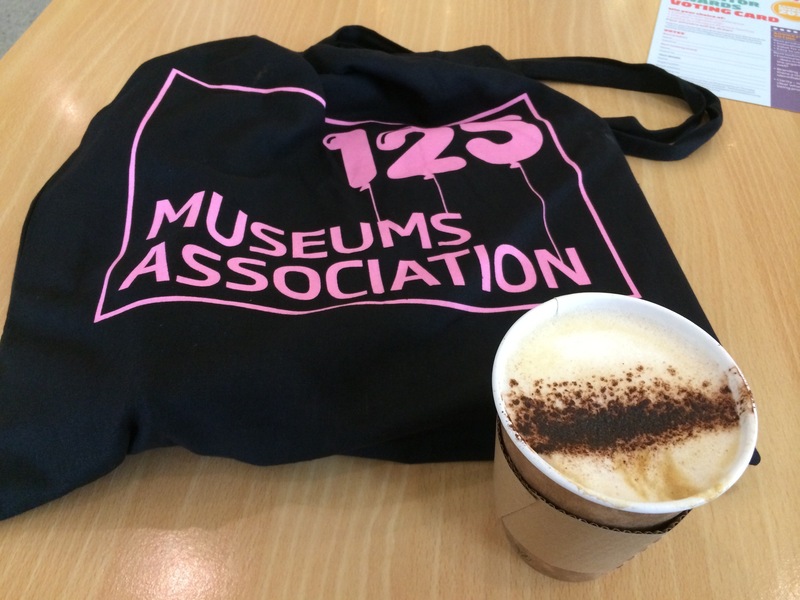 The 2014 Museums Association Conference was also the 125th anniversary of the organisation. This was reflected in the opening address by the current president and included a look at past influences on the museum world. I now have a list of interesting people to read about! 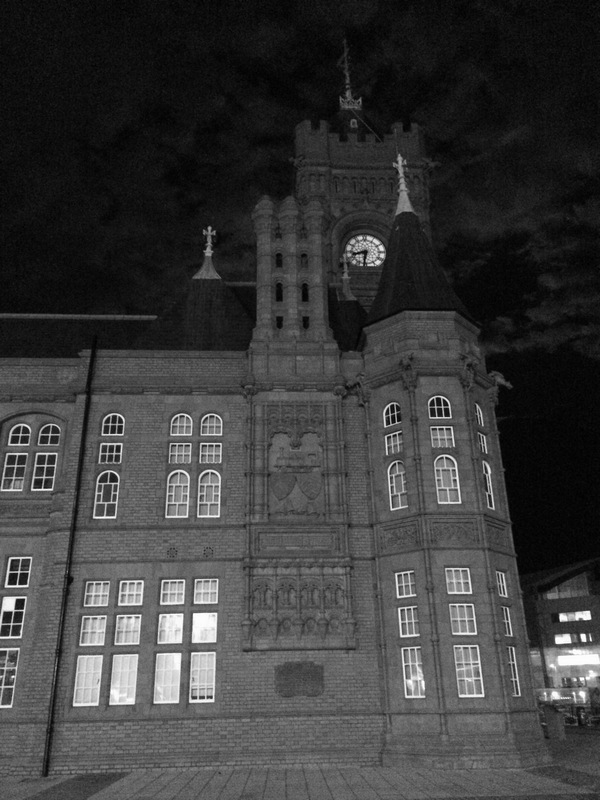 The venue was Cardiff and it was great to see the centre of the city and some of Cardiff Bay. I enjoyed seeing friends and meeting new people at the pre-conference tweet up at the Norwegian Church. A lovely building that moved and with a fascinating history. As usual part of conference was meeting people and catching up. Having a choice of cafés in the main venue definitely helped with this. Regular coffee helped keep conference fatigue at bay too! Another part of the experience is meeting new people and thinking of new collaborations. I’m looking forward to catching up with the Collections Trust, Leicester University and the Modes team in the near future. Discussing shared issues with different perspectives is always refreshing too. I expect to continue several conversations and thoughts started at conference. As usual there were so many things going on it was hard to chose what to go to. Two of us had gone from RAMM which helped cover more ground. Disappointingly a couple of events were crowded out with standing room outside only. It wasn’t only sitting and listening by any means. Handling ceramics while getting an artist’s view of working with museums was an unexpected pleasure. A moving performance by Mat Fraser on museums and disability made a powerful opener to the second day that will stick with me for some time. 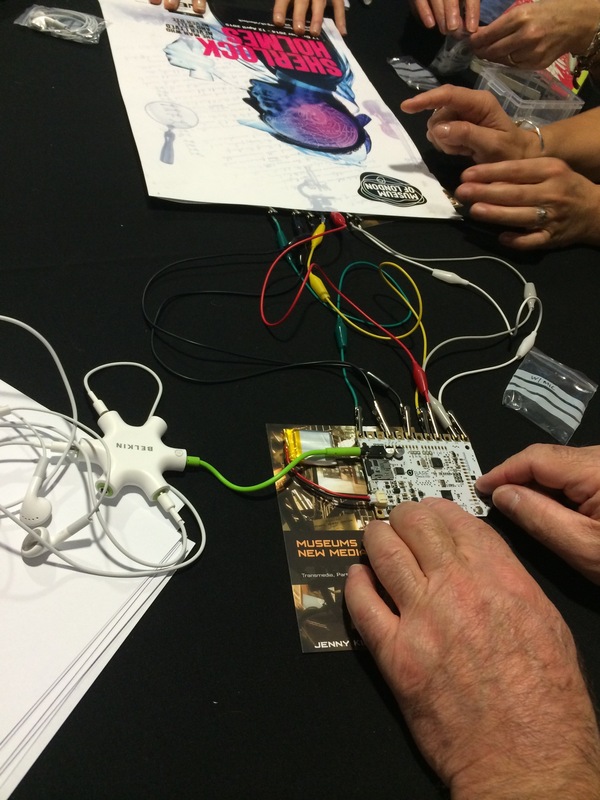 Paul Clifford from the Museum of London ran a session the Maker Movement which was great fun. Not only because of his enthusiasm but also because we got to try things out. Encouraging cognition through making tied in with some of the ideas from the opening address. The 125th celebration at National Museum Wales was in a great space and had a festive feel to it. When people were asked to clear under the central dome I wondered if a giant cake would be wheeled in and Mark Taylor leap out to celebrate his years of service. Three acrobats in swimsuits were almost an anti-climax after that thought! Just hope I can go to conference 2015! Despite the redevelopment at the Roman Baths having completed some time ago I only went there last week. Having gone there several times over the years, perhaps most memorably one Autumn evening when there were few people about, I was keen to see what had changed. Braced with a large lunch my friend and I queued to get in enjoying the costumed people passing by. It turned out the people in Regency Costume were involved in a successful record attempt in the Assembly Rooms as part of the Jane Austen Festival. 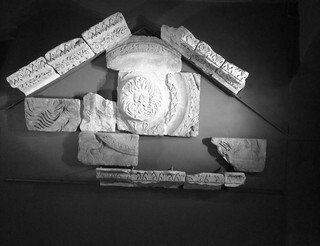 The Roman Baths are really popular which means visitors need to keep moving so as not to jam up the limited space. I thought the way this was managed from admissions to interpretation worked well. Admissions were done in batches to break up the crowd and the very busy desk staff were really welcoming. I liked the way objects were displayed with enough interpretation to inform but not so much to keep you reading for ages. 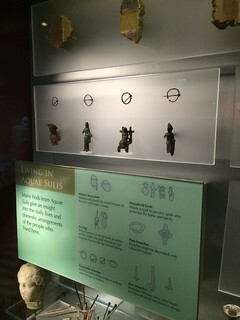 Rather than itemising each item objects were often in groups with a general description for each group. This kept dwell time down while still being informative. It meant less text and more space for the objects too. I also liked the way this kept more of a thematic feel to the object displays. Naturally being a digital museums chap I was interested to see how digital was used. Again the need to keep visitors moving was borne in mind so the usual touch screens were replaced with projectors and video players. The video fly throughs and reconstructions are very cleanly and crisply done which gives them a feeling of immediacy. Having them populated gave a sense of scale to the reconstructed buildings and helped show the diversity of people using and working in and around the baths. I really liked these. I found the use of projectors well balanced and thoughtful. The gaps in projection meant you could view the remains as just that. 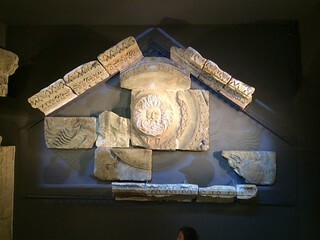 A good example is the temple pediment where a projected image shows what it might have looked like when complete, and when the projection is off you clearly see the surviving fragments. 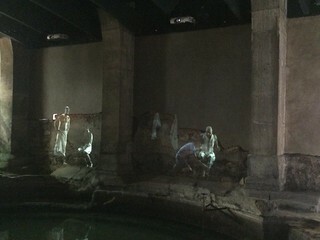 Projectors are also used to populate areas of the baths with Romans. I really enjoyed this for two reasons. One is it helped get across the place was busy and many different types of people used the baths. The second is the quality of light made the projected people have a faint ghostly feel to them which gave me a poignant peeping into the past feeling. I admit I didn’t try the audio tour as I find they aggravate my hearing problems. However, I know a friend who has tried them and gave them the thumbs up! One thing that makes this audio tour stand out is it isn’t one size fits all. There’s the standard tour, a kids tour and some commentary by Bill Bryson at selected spots. Plus a BSL guide and enhanced audio tour for people with visual problems. To make the hat trick you can even download the tour. A final point on the audio tours is the way stops are handled. The different tours are colour coded and included on the same sign as other interpretation. I do like this economy of signage as you can probably tell! Both of us really enjoyed the visit and recommend it if you’re in Bath. 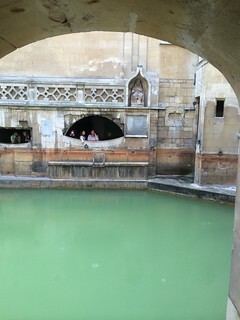 Whilst you can’t take the waters at the Roman Baths any more there is a package deal including the new spa in Bath. Museum Next is a well established two day conference looking at innovation, technology and emerging trends in museums. It’s the largest conference of its kind in Europe and attracts delegates and speakers from around the world. This year they invited me to speak! Generally digital technology is maturing in museums although lack of resources is a growing barrier. The problem of digital being put in a compartment and ticked job done is still present for many people. The problem of management appointing digital staff and then not supporting them in implementing change in their organization is also still widespread. Innovation is still present and different people have different takes on it. A presentation from a commercial development company on Bluetooth LE was very different to the approach being taken by us and Cambridge University Museums. What was two days of museum innovation technology like? In a word it was great! Meeting so many enthusiastic people with considered ideas on museums and their relationship with technology really restored my own enthusiasm. Catching up with friends and colleagues was a pleasure as usual. Jim and the team at Sumo did a great job of keeping us thinking and listening not to mention fed and watered. 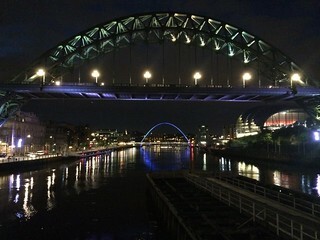 And being in Newcastle is always a pleasure. My talk was at the end of day one so I kept a light tone to keep people engaged but ensuring I got my key points across. 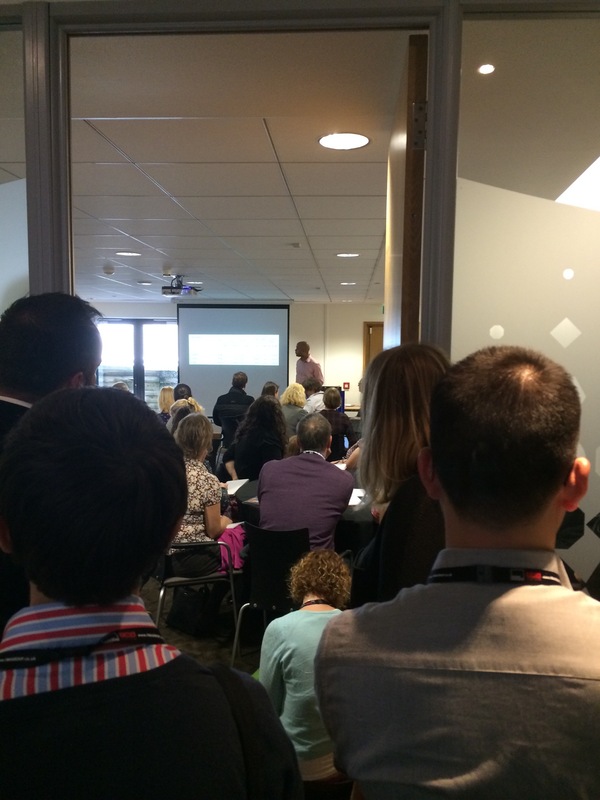 My talk is on my Slideshare page and was all about how we got collections online where I work. Koven’s talk around are museums still reinventing themselves online produced the problems mentioned above. His main point is we should no long produce websites that are skeuomorphs of our museums. We should create authentically digital experiences based on usability, agility and focus. Suggested way forward is: make usable products; focus on real needed; structure for agility; eliminate skeuomorphs. That last one is very pervasive and hard to stop people doing in my experience. Tate website’s relaunch was based on analytics and part of knowing audience inside and outside Tate. The workflow was established and documented to support its introduction. Key issue is digital needs to be part of museum strategy not separated, and museum staff need to work as a network to deliver effective digital content. Be prepared to make things obvious – analogy of change from gas to electric lighting meant saying no matches needed for electric. Business has seen a 26% increase in value through using digital technologies. There is potential for museums, especially using their own big data (CRM, analytics, collections and knowledge data). Dana worked at SFMOMA before becoming a Design Thinking guru and is a museum consultant. Start with real visitors and use paper prototypes instead of wireframes. Find how visitors want to explore by capturing what they do in the museum, and make sure website helps them do this. Talk to visitors, question your assumptions and define problems before looking at solutions. Design thinking five steps Empathise, Define, Ideate, Prototype, Test. A small Dutch village was levelled to make a new town. The position of the houses was marked out in brick in the new plaza. 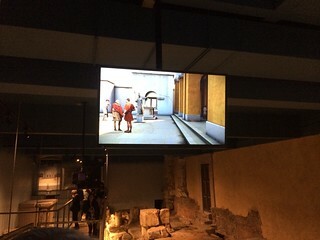 An augmented reality (AR) version of the old buildings was created from photos and memories. An app was created to enable users to view the old village in the square. The app has a built in height adjuster and the first thing the user does is enter their height so the AR displays in the right place for them. Activation was through a photo of the building embedded in the square. This also ensured the building displayed at the correct height as GPS is not always reliable and items may float if using GPS alone! Finally an AR telescope was created for people without smartphones. Thinking beyond apps like this cropped up a few times. Minecraft is a game played mainly by 5 to 11 year olds and late teens early 20s. For museums a bespoke landscape can be created from Google Satellite or from OS digital maps. Equally a scanned item even a body can be made into a map! Learning involves from reality to model, download to make YouTube video, print in 3D (cad for kids). Adam has used Minecraft in workshops and specific museum projects. Tullie House Museum wetlands project http://thecommonpeople.tv/page8/page5/index.html and walk into paintings at The Tate http://thecommonpeople.tv/page6/index.html . This was a very information rich talk and the slides are well worth looking through. http://colleendilen.com/touch-love-and-museum-data-slides-shared-at-museumnext/ I think this was the best combination of content and speaker of the conference. and services. She used the term High Propensity Visitor to describe someone really engaged with the museum and with digital connections to enable them to share your message. Trends of the moment included continued growth and increasing trust in social media; importance of reputation in persuading people to visit; paid media is beneficial; reviews from trusted resources (Trip Adviser); email still significant but slowly reducing (Tate has found ticket sales via email have increased recently). Connection is essential, whether speaking to a member of staff in the museum or connecting online via social media converts a visitor to High Propensity Visitor. Then keep in touch and grow affinity through digital channels. With commercial offers reputation translates to revenue. Jackie spoke about their app called Float. This relies on movement tracking and asking questions about how the visitor feels to elicit a response. You can then share your thoughts with other visitors. The development of the C You app showed how the challenge of engaging young people was addressed. It focused on fun, learning and sharing. A linked exhibition allowed sharing via the user’s in app ID. This was a very practical review of the challenge of scanning a gallery full of model boats and ships. Prior to clearing the model ship gallery in the science museum it was 3D scanned to archive it and provide a virtual gallery. Architectural scanning techniques and equipment were used. Scanning models meant the under camera blind spot was not such a problem as in scanning a building. I enjoyed this partly becuase the ship gallery was one my favourites when a small boy in the late 1960s! Starting inside the museum they discussed the possibility of the museum as a third space and technology enabling this (home is the first space and work the second space). Museum and non-museum examples were used to illustrate the possibilities of digital delivering content and interaction beyond the museum. Emphasis was on content to start engagement. Their key points for creating an app (they only spoke about apps) were: content; discovery and choice; serendipity; location specific; emotional connection. Looking forwards included two Google products. One used their API enabling Marseilles Night Walks https://nightwalk.withgoogle.com/incompatible?l=en and the other being Project Tango aiming to bring a human like understanding of space and motion giving depth perception to apps for example. From a question I asked it seems wifi and 3/4G signal act as limits on how far outside the museum we can get. Marty used his talk to give a very practical guide to using SEO and search to promote your website. Search marketing is the link between the website user and your website. If you want website visits get that bit right! From the basics of writing good page titles and meta descriptions to news jacking he included everything. This included discussing whether paid searches are worth investing in from a brand protection point of view. He included a recap of Google releases, from simple crawling of websites to today’s sophisticated content evaluation algorithms. He also connected different platforms to achieve his goals. For example taking an aspect of the collection and creating a competition around it. He used a set of Orientalist paintings depicting travels through the Middle East to launch a travel themed competition. The process was simple – ask visitors to put a photo of their travels on Instagram with #artoftravel. This was pulled into Pinterest and a public vote took place. 6,000 entries and 400,000 views were the result. And the winners got two flights anywhere in the world. Another example was to put a100 paintings on Pinterest then ask people to create their own board of ten and have a public vote. The winning board was made into a temporary exhibition. Anna had a similar experience of starting from scratch to ours at RAMM and had to get the organization behind her. After three years she wrote a strategy based on Tate’s and had more people working with her across seven platforms and four Moscow museums. Like us at RAMM they find more followers and interaction on Twitter than on Facebook. Content is created on a Monday and a publishing schedule completed to ensure everything is coordinated across the four museums. This does reduce spontaneity but allows a planned approach. Recently a Twitter campaign with real postcards via #museumpostcard proved successful with recipients sharing photos of the real postcards the museum sent to them. The cards included QR codes for easy linking! Hard to choose but the first keynote for its aspirations to make digital part of the whole, and to stop recreating the museum online and in apps is just ahead of a crowded field! I think Adam Clarke and his work with Minecraft and collections is a worthy runner up!